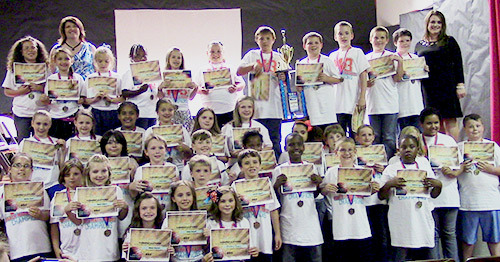 OKLAHOMA CITY (April 24, 2014) — Students at Fox Elementary School in the Carter County town of Fox, Okla., recently topped more than 11,970 other schools throughout the nation to claim title in a nationwide math competition. The winning students are slated to be recognized at a 6:30 p.m. awards ceremony this evening (April 24) at the school. State Superintendent of Public Instruction Janet Barresi congratulated students for winning Think Through Math’s “March Math Madness” competition. Third- and fourth-grade students at Fox completed 143,825 math problems and took 5,293 math lessons during the contest. All together, they spent 869 hours on the program, including 99 hours when class was not in session. Fourth-grade teacher Becky Tivis said the school opened its computer lab for two days during spring break so students could come in and take lessons. Many used Think Through Math at home in addition to a daily class set aside for the program. Think Through Math is a web-based program that challenges students with customized lessons and encourages learning with rewards and competitions. It allows students to practice mathematical concepts at their own pace, while providing classroom teachers with live progress reports. Tivis said things really began to heat up when the kids realized they had made it to the “sweet 16” schools in the bracket-styled competition, which is scored by the number of successfully completed lessons. While Tivis noted that the Fox students particularly wanted to beat any schools from Texas, their focus was on earning the championship. The Oklahoma State Department of Education (OSDE) contracts with Think Through Math to make it available to districts at no cost to them, although there is a limit on the number of total users. Districts also can contract with Think Through Math, which is what the Fox School District did. OSDE first contracted with Think Through Math in the 2012-2013 school year. Many schools use Think Through Math in the classroom, but it can also be utilized by students when school is not in session. The company includes certified math teachers are available to chat with students when they need help with a lesson. In the 2012-2013 school year, more than 70,000 Oklahoma students signed up for Think Through Math. The program answered almost 17 million math problems, nearly 3.5 million of which were completed outside of class. Students also spent nearly 10,000 hours receiving one-on-one assistance through the program.